Are you already learning Irish? Then discover the 10 secrets to practicing the language every day. Even if you don’t live in Ireland. 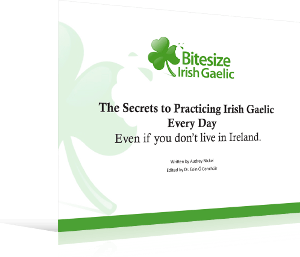 To make the most of Bitesize Irish online Irish course, you should practice every day! That’s not so, but you can do it if you decide to. We can help you. This ebook has 30 pages jam–packed with ideas you can implement in your daily life. Discover the 10 secrets that teachers use to get their students practicing. The ebook is meticulously written. It describes in detail how you can start to use Irish every day — even if you don’t live in Ireland. The ebook is suitable if you’ve already started your Irish language journey. It won’t be so applicable if you haven’t yet started learning any. Untap the secrets of teachers for practicing language learning every day. 10 effective, yet uncomplicated, methods for your to implement. Written by Audrey Nickel, who has had first-hand experience with both learning and teaching Irish in California. Full 30 day money-back guarantee if you’re not impressed. There not much to lose, and a lot to gain. Secure encrypted checkout. Credit cards and PayPal accepted.